Prism Business Media Holdings, Inc. Acquires Penton Media, Inc.
Prism Business Media Holdings, Inc. has acquired Penton Media, Inc.
Prism Business Media Holdings, Inc. has acquired Penton Media, Inc. (OTCBB: PTON). The Seller Penton Media, Inc. (http://www.penton.com/), a diversified business-to-business media company, provides high-quality content and integrated marketing solutions to the following industries: aviation; business technology Enterprise Information Technology; design/engineering; electronics; food/retail; government/compliance; hospitality; manufacturing; mechanical systems/construction; and natural and organic products. Penton produces market-focused magazines, trade shows, conferences, and online media and provides a broad range of custom media and direct marketing solutions for business-to-business customers worldwide. The Buyer Prism Business Media is a leading producer of targeted publications, Web sites and exhibitions that bring sellers together with qualified buyers. It consists of more than 70 publications, 130 Web sites, 180 e-mail newsletters, more than 20 trade shows and more than 450 directories and books that serve professionals in 20 market sectors including: Agribusiness, Communications, Electrical & Public Services, Entertainment, Marketing and Transportation. 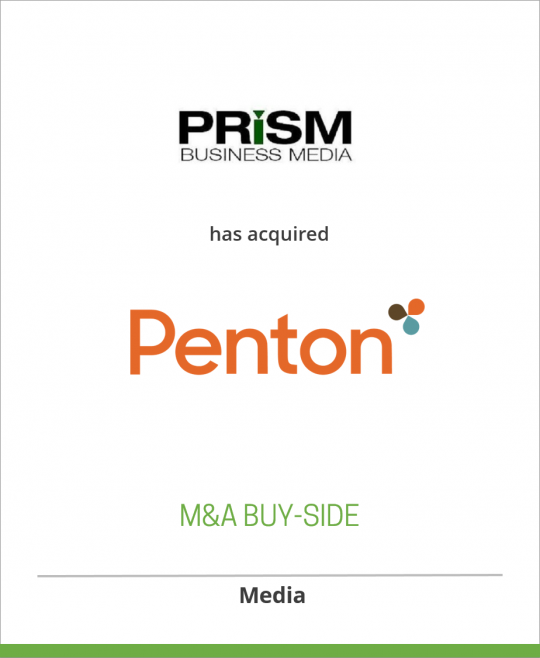 Client Prism Business Media Holdings, Inc.
Has acquired Penton Media, Inc.